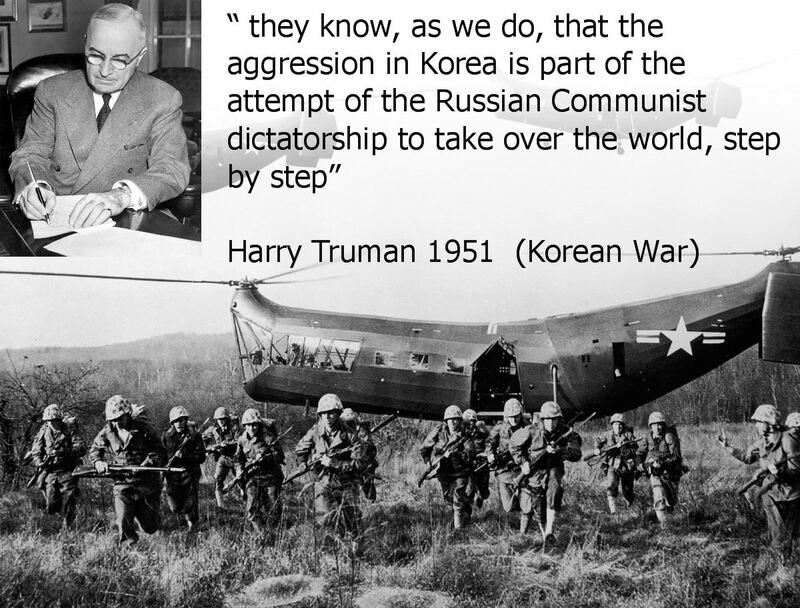 HARRY TRUMAN'S "FAKED KOREAN WAR"
Once you know the true story of the Korean "war", it is easy to progress to a higher level of knowledge, including the fact that WW1, WW2 and WW3 were also started and centrally controlled by the English-Triumvirate (Beast, City, Rothschilds). Once you KNOW this, once this has established itself in your store of KNOWLEDGE, you will realize that all major wars after 1800 featured internationalists who were loyal to no particular country, not even their own, but whose primary allegiance was to the internationalist ideal of subjugating all mankind under a Caesarist soviet Technocracy. And that is why you first need to know the true story of the Korean "war". Although the major wars of the twentieth century were all started and run by the English-Triumvirate, nowhere did the war-makers leave as many foolish clues behind as in the case of the Korean "war." This "war" was contrived to give wings or lend credence to the genocidal UN, a private totalitarian organization founded by Chatham House, in its quest to sovietize first the east and then the west. But because the Korean "war" was the UN's debut war-making effort (orwellized to "peacekeeping"), the English-Triumvirate made very many mistakes, leaving far too many clues (for all the world to see) and allowing far too many major players to make public statements, so that it ultimately proved impossible to suppress the truth that this "war", which is still ongoing today, was in fact a total fake. When "historians" tell the story of the Korean "war," they usually start far too late at the point where North Korea has invaded the south, thus avoiding the root cause of the "war", which was the creation of North Korea in the first place. At Teheran and Yalta, FDR asked Ioseb Jugashvili (of the black luciferian Grand Orient Lodge, nickname Stalin) to enter WW2's Asian front versus Japan, despite the fact that Jugashvili had a non-aggression pact with Japan. Jugashvili consented on condition that he get trucks, tanks and equipment for Russia's far-eastern army. FDR fulfilled this demand by sending 600 material shiploads to Jugashvili for the express purpose of fighting Japan. Jugashvili immediately reneged on his promise by staying out of the fight until Japan had all but surrendered. The only Russian involvement in the far-east was in China, where after very limited fighting, the Russians gleefully accepted the surrender of several major Japanese weapons depots. The Russians then gave these weapons (plus their own weapons which had been supplied them by the USA's lend-lease program) to Mao Zedong, in keeping with their orders from Chatham House. When North Korea invaded South Korea, the USA supported the latter under the auspices of the UN. In 1935, William C Bullitt (the USA's ambassador to communist Russia) sent a dispatch to the US foreign-minister stating: "It is … the heartiest hope of the Russian government that the USA will become involved in war with Japan … Russia would certainly attempt to avoid becoming an ally until Japan had been thoroughly defeated and would then merely use the opportunity to acquire Manchuria and sovietize China". The latter actually proved very "prophetic". It was exactly what happened. Clearly, the west did not need Russia to help it defeat Japan. Russia was really just given control of North Korea free-of-charge because this had been Chatham House's plan all along. In April 1944, the Chatham-House-controlled CFR placed an article in its flagship "Foreign Affairs" publication entitled "Korea in the Post-War World" which asked the pointed question: "Will the new international organization (i.e. the genocidal UN) now under discussion be functioning in time to undertake the job of administering Korea? It does not seem probable … There is also the possibility that a trusteeship for Korea could be assumed not by a particular country but by a group of powers, say the USA, the LateGreat Britain, China and Russia". Thus far, Korea had been a protectorate or colony of Japan. The agreement was worked out in a meeting between Jugashvili and Harry Hopkins. Harry Hopkins was a close adviser to elitist-communist FDR, was the US commerce-minister and worked as an agent for both Bernard Baruch and Jugashvili. The book "Major Jordan's Diaries" documents how Harry Hopkins sent Russia the blueprints for its first atomic bomb, compliments of elitist-communist FDR. In North Korea, Jugashvili set up a massive well-equipped army under Kim Il-Sung. Professor Antony Sutton wrote that North Korea killed 33,000 of the USA's troops (luciferians love the number 33 so maybe the war was made to last until 33,000 of the USA's troops had been sacrificed) and wounded 103,000. He added that the North Korean Army was 130,000 strong and was trained, supported and equipped by Russia, that the North Korean Army had a brigade of 380 Russian T34 medium tanks with Christie suspensions made in the USA, that their artillery tractors were diametric copies of Caterpillar tractors, that their trucks came from the Henry Ford's Nizhny Novgorod plant, that the North Korean err-force had 180 Yak planes that had been built in plants that used lend-lease equipment from the USA and that these Yaks were later replaced by MiG-15s powered by Russian copies of Rolls-Royce jet engines sold to Russia in 1947. The Korean "war" was only foreseen as military theater in which the genocidal UN was to earn its reputation as a war-making organization (orwellized to "peacekeeping"). In 1949, the USA had abandoned South Korea, leaving no tanks, no anti-tank guns and only 22 planes of any fighting capacity. This was in stark contrast to North Korea's total of 450 fighters. In 1947, Albert C Wedemeyer had gone on a fact-finding mission to Korea but his report was suppressed by General George Marshall and DirtyHarry Truman. After he retired though, Wedemeyer wrote the book "Wedemeyer Reports" quoting as follows from his suppressed 1947 report: "The withdrawal of the USA from South Korea would result in the occupation of South Korea by either Russian troops or, it seems more likely, North Korean military units trained under Russian auspices in North Korea". That was also "prophetic". In Jan 1950, Kim Il-Sung addressed his people urging "preparedness for war, unification". Two weeks later, the USA's foreign-minister Dean Acheson placed South Korea officially outside the USA's perimeter of defense. That was basically an OPEN INVITATION requesting North Korea to invade South Korea. 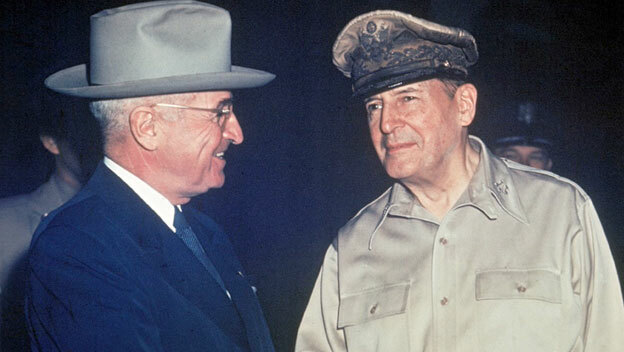 General MacArthur conceived and conducted a daring end-run by invading Incheon Harbor, at which point he could have crushed the North Korean forces. He fought all the way to the Yalu River, i.e. to the border between China and North Korea, effectively winning the Korean "war" outright. Then, when the Chinese started entering the war, MacArthur simply ordered the Yalu's bridges bombed in order to defend his victory and keep the Chinese out. But, within hours, this order was COUNTERMANDED by General George Marshall. General MacArthur had learned the hard way. He said: "I realized for the first time that I had actually been denied the use of my military power to safeguard the lives of my soldiers and the safety of my army. To me, it clearly foreshadowed a future tragic situation in Korea and left me with a sense of inexpressible shock". Long story short: When a confused MacArthur complained of the restrictions placed on him, he was dismissed. Ergo, the whole Korean "police action" (as DirtyHarry Truman orwellized it) or "war" was a complete farce from start to finish. 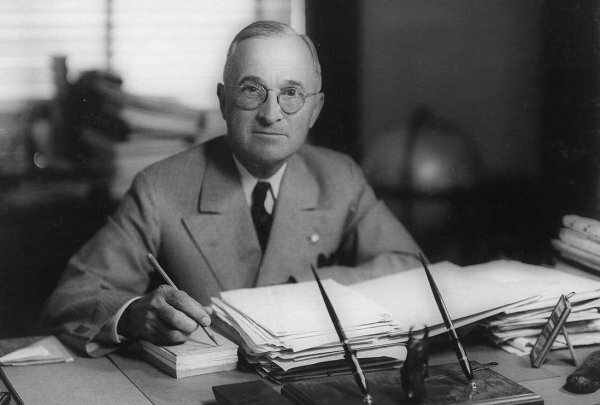 Dirty Harry Truman also helped to get the Chinese involved when he stated: "I have ordered the Seventh Fleet to prevent any attack against Formosa (now Taiwan). As a corollary of this action, I am calling on the Chinese government in Formosa to cease all air and sea operations against the Chinese mainland. The Seventh Fleet will see that this is done". The latter indicated that "Free"-China's leader Chiang Kai-Shek (who was in Formosa) was not going to intervene (e.g. by re-invading communist China from there). And that was the green light for China to do as it pleased in Korea. In 1947, the Chatham-House-controlled CFR formulated the policy of "containment" and published its launch in their publication "Foreign Affairs" in an article attributed to stooge George F Kennan. It basically defined the USA's strategy for fighting the whole phony "cold war" over the coming decades and was adopted as policy by Chatham-House-puppet DirtyHarry Truman. The word "containment" meant that Chatham House was basically ordering the USA to fight only ever for a stalemate for the entire duration of the phony "cold war" over the coming decades. Kennan also wrote: "We have about 50 percent of the world's wealth but only 6.3 percent of its population. In this situation, we cannot fail to be the object of envy and resentment. Our real task in the coming period is to devise a pattern of relationships which will permit us to maintain this position of disparity. To do so, we will have to dispense with all sentimentality and day-dreaming; and our attention will have to be concentrated everywhere on our immediate national objectives. We should cease to talk about vague and unreal objectives such as human rights, the raising of the living standards, and democratization. The day is not far off when we are going to have to deal in straight power concepts. The less we are then hampered by idealistic slogans, the better". Two days after North Korea invaded South Korea, the genocidal UN issued Resolution 83 which called on its members to aid South Korea (naturally, 83 got chosen as a ritualistic numerological opposite to Korea's 38th parallel). The Korean "war" was a UN war (orwellized to "peacekeeping mission") that Russia could easily have prevented in the UN's Security Council. But Russia had staged a show-business walkout in "protest" at the decision by the four other permanent members (who included Formosa) to refuse communist China a seat at the Security Council. Trygve Lie (Norwegian foreign-minister and the first UN secretary-genocidal) actually invited the Russian delegate to attend the vote on UN Resolution 83 on Korea. Before the resolution, at lunch in the Stockholm Restaurant on Long Island, the UN secretary-genocidal Trygve Lie met a group including Ernest Gross and the Russian delegate, Jacob Malik. Gross and Malik sat on either side of Trygve Lie. The three men talked at length about the Korean "situation". About the time the meal was reaching coffee and dessert, the secretary-genocidal performed his duty as an international officer and urged the Russian to end his boycott of the Security Council and to attend the meeting that afternoon. "Won't you join us?" Lie urged. "The interests of your country would seem to me to call for your presence". But Malik shook his head vigorously. "No, I will not go there". This was no mistake, it was deliberate. The proof of that: Malik was never punished by Jugashvili or by the communist party. Quite the opposite in fact, he died peacefully in 1980. Years later, Chinese General Lin Piao also spoke about the conflict, saying: "I would never have made the attack and risked my men and military reputation if I had not been assured that Washington would restrain General MacArthur from taking adequate retaliatory measures against my lines of supply and communication". Hence, the UN made sure the contrived Korean "war" was never won. The Korean "war" is still in progress today and is in a state of ceasefire recognizing the condition of uti possidetis (i.e. territory occupied shall remain territory controlled until the war ends formally). Hence, North Korea, the USA and other western powers remain technically in a state of war although the USA never actually declared war since 1941 or, more particularly, the USA never actually declared war since being volunteered in Oct 1945 to become the military police force (or world army) for the English-Triumvirate's genocidal UN. General MacArthur was in command of UN forces in Korea, but Russians Arkady Sobolev and Konstantin Zinchenko were heads of the UN military staff and therefore knew all orders given to MacArthur, which information they undoubtedly passed promptly to the communist commanders in North Korea. General MacArthur gave his reports to Konstantin Zinchenko. That shows even more clearly what a total farce the Korean "war" was. Again, the motive for the Korean "war" was to validate the UN, i.e. to prove to the world that it had a raison d'être. Chatham House had already decided the structure of the UN in the 1930s. 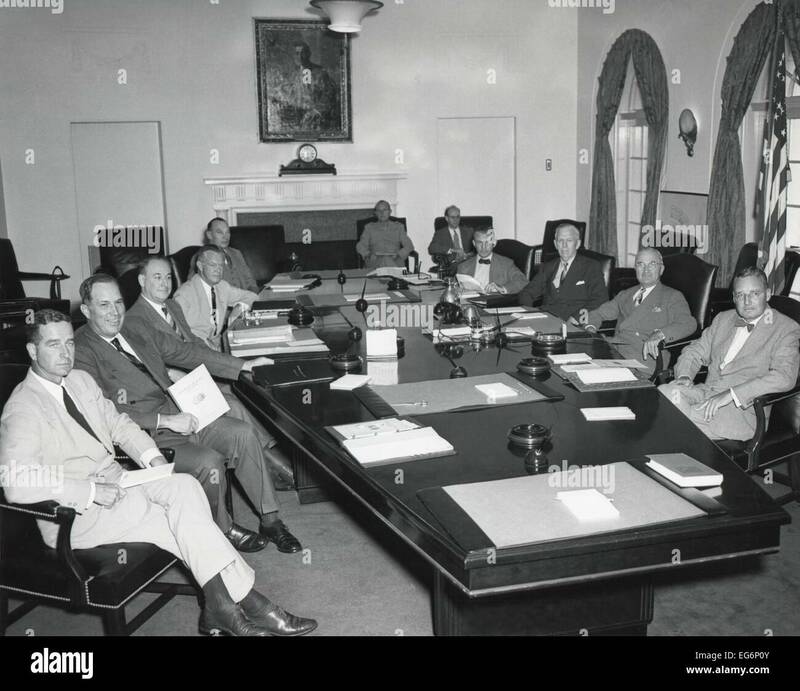 During WW2, a group of CFR members in the US called the Informal Agenda Group drew up plans on how to force the US into the UN, and thus avoid another League of Nations debacle where the US senate had sensibly kept the US out. Elitist-communist FDR stated "the top post-war agenda is world government". This was the exact same as Woody Wilson's post-WW1 agenda that got foiled by the US senate. On 1 Apr 1952, Adlai W Stevenson's article "Korea In Perspective" was published in the Chatham-House-controlled CFR flagship publication "Foreign Affairs". In it, he stated: "The burden of my argument, then, based on the meaning of our experience in Korea as I see it, is that we have made historic progress toward the establishment of a viable system of collective security". The term "collective security" was nonsense because 90 percent of the UN forces had been supplied by the USA. The joke of course is on the people who believe those history books which claim the Korean "war" was down to happenstance, the joke is on the coincidence theorists. Because every step of the way, the next contrived step could have been avoided. There was no real reason for giving North Korea to Jugashvili in the first place, so there was never any reason for the Korean "war" to start. The USA could easily have prevented the Chinese from invading but countermanded their own (MacArthur's) orders to destroy the Yalu's bridges. So there was no reason for the Korean "war" to continue or for Korea to end up partitioned. Both the US and the Russians could have prevented the Korean "war" from ever happening, but neither did so because both were under orders from Chatham House. From start to finish, the Korean "war" was contrived and centrally controlled, end of discussion. And a little research will prove that all wars over the last two centuries were contrived and centrally controlled by the exact same families and groups. Modern wars are really for shaping humanity through fear, for ritual sacrifice to Lucifer and for increasing centralized world control for the power-elite's glorious-soviet Technocratic World Union.